Slate roofing is a beautiful, durable material that has been used for centuries. Some of the world’s greatest buildings feature slate tiles. While this luxurious material was once very pricey and out of reach for most commercial property owners, advances over the last several years have brought slate tile to the table as a viable option to create a memorable, structurally-sound roof. Considering slate tile for your new commercial construction or roof replacement? Call Burell Built Exteriors at (865) 385-6926 to learn more about slate roofing for your Knoxville, TN or Chattanooga area commercial property. The natural beauty of slate roofing adds incredible charm and character to any structure. Commercial customers can certainly bring this bold look to small and large properties to enhance the overall aesthetic of the exterior, which can also be a huge benefit for resale value. There are many color and texture options to choose from when it comes to slate, and our team can help you design an impressive roof that will last for years to come. 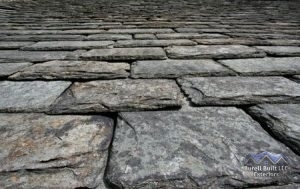 In fact, some slate roofs have lasted hundreds of years, so when we say strong, we mean strong! Already have a slate roof? Fantastic! Call us for repairs or maintenance inspections to ensure that your beautiful roof continues to perform well. We can replace or repair missing or damaged tiles to retain that clean, classic look, and know how to carefully navigate slate roofing to avoid further damage or wear in the process. The most effective way that commercial property owners can protect their roof investment–be it slate, shingle, TPO, Duro-Last, sprayed polyurethane foam, etc.–is to participate in regular maintenance. Keeping an eye out for cracks, weakened materials, compromised flashing, and debris can prevent more substantial, costly damage down the road. We offer an Annual Maintenance Agreement for our commercial customers that includes two detailed inspections per year. Especially with larger buildings, this is a simple, hands-off way that property owners can rest easy that their roof is performing well without having to get up on a giant ladder or scaffolding to do the assessment. Call us at (865) 385-6926 for a free slate roofing estimate for your Knoxville, TN area commercial property, or (423) 702-4042 in Chattanooga, TN! Updated on September 16, 2016 at 1:35 pm by Burell Built Exteriors.